At Vaughan Capital Advisors (“VCA”), we talk with business owners all the time who have a target valuation in mind for when they will pursue a sale of their company. We call this “knowing your number”. As a general matter, knowing your number is a good thing and gives you and your shareholders a clear target to shoot for when designing the corporate and commercial strategies of your company. Many times there is a timeframe business owners are working on. As an example, they have set in their mind that they will sell their company three years from today for $100 million. There are scenarios where the best advice we can give is for a business owner to close a transaction in the next six months at today’s valuation of their company, and to have VCA structure the transaction such that they hit their number in two and a half to three years in the form of contingent consideration (also known as an “earnout”) based on the projections of revenue and cash flow they already had in their three-year plan for the business. Why does this structure work for VCA’s customers? This transaction structure works for VCA’s customers because in many cases having a liquidity event today can help a business address many of the personal areas of his or her life that occupy more mindshare than he or she is fully aware of. These personal areas may include supporting a growing family, making mortgage payments, caring for aging parents, and paying for private schools and college tuition. Before selling the company these obligations are paid for with salary, bonuses and dividends from their business. 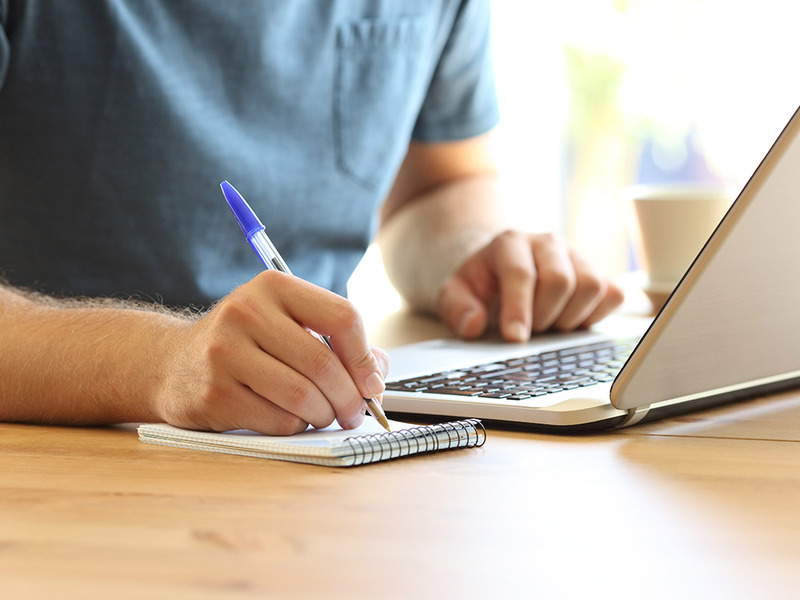 After selling all or a portion of your business, these obligations can he addressed with a lump sum of personal cash from the proceeds of your deal. The freedom of knowing that all of your obligations are satisfied can contribute to the peace mind needed to take your business to the next level which can now happen on the larger platform of the acquiring business. In addition to peace of mind, taking some cash off the table in a transaction today takes some of the risk out of your model. While you and your team are very good at running your business, there are macroeconomic and competitive factors that are beyond your control. The Fed may raise interest rates, the government could enact regulation that dramatically impacts your sector, or Amazon may enter your market. Any and all of these factors could negatively impact your three-year revenue and cash flow projections. A larger company that acquires your business may be better able to absorb the shocks of macroeconomic and competitive market dynamics. Meanwhile, if you have sold your company to that larger acquirer, you have cash that protects your personal financial profile from macroeconomic and competitive factors that are largely beyond your control. 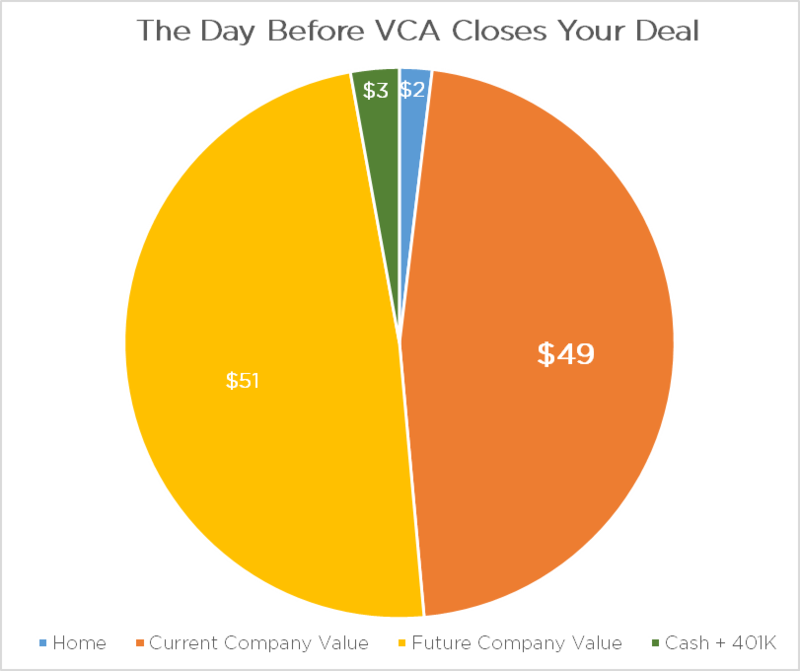 Let’s look at a snapshot of your personal financial portfolio the day before you sell your company (“The Day Before VCA Closes Your Deal” graph to the right). We are making some simple assumptions to make the point. If you company is generating $7 million in cash flow and would get a 7x cash flow valuation today, your company is worth $49 million today. If you believe your company will be worth $100 million in three years due to cash flow growth and/or multiple expansion, the future value of your company will be $51 million. A business owner with a company of this size might own a home with $2 million in equity value and have a 401K or retirement account with $3 million. Remember, the “Current Company Value” in the graph is theoretical and can only be accessed through closing an M&A transaction. 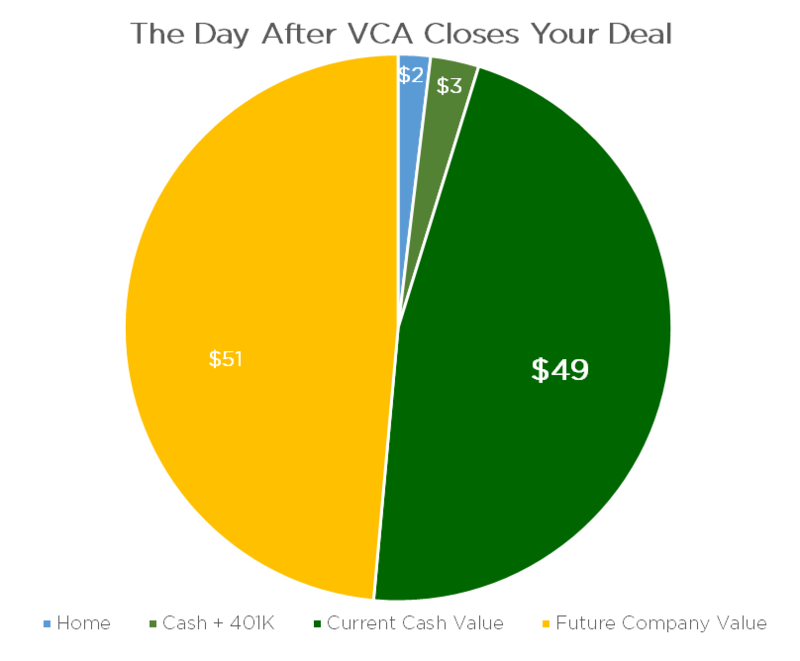 Now let’s look at a snapshot of your personal portfolio the day after VCA closes your M&A Transaction (“The Day After VCA Closes Your Deal” graph to the left). In this scenario, The “Current Company Value” from the previous graph has been converted to “Current Cash Value” – as in it now sits in your bank account as cash. So now rather than having that $49 million of cash at risk for three years until you reach your targeted $100 million valuation, you have secured $49 million in cash today. You still have the ability to earn the future value of your company, or $51 million, in a three-year contingent consideration structure (also known as an “earnout”) based on the three-year plan you had already created for the growth of your company. Remember, our simple example is meant to show you how you can create a liquidity event today that still preserves your ability to hit “your number”. We believe this kind of transaction can de-risk your personal financial model and clear your mind to aggressively build toward the $100 million target valuation (with $49 million of the $100 million already secured) by playing offense rather than trying to defend the value you have already created (which usually reduces the possibility you hit your $100 million target, in this example).